1. Why a Multifamily Automation Survey? 2. Were the Properties Responsive? 3. How Long Did it Take for a Property to Follow-up? 4. Were the Leads Nurtured? 5. Could Leads Self-Serve Using an Automated Tour Scheduler? 6. Were Leads Sent a Night-Before Tour Reminder and Missed Tour Follow-up? Hy.ly conducted a multifamily marketing automation survey to find out the state of automation in multifamily. We present the results in this seven-part series. Why a Multifamily Automation Survey? Automation is the new “It” word in the multifamily world so we wanted to see who is using it and what they are using it for. During March and April of 2018, we decided to conduct a survey to assess the state of automation in the multifamily industry. How long does the property take to follow-up via email? How long does the property take to follow-up via phone? 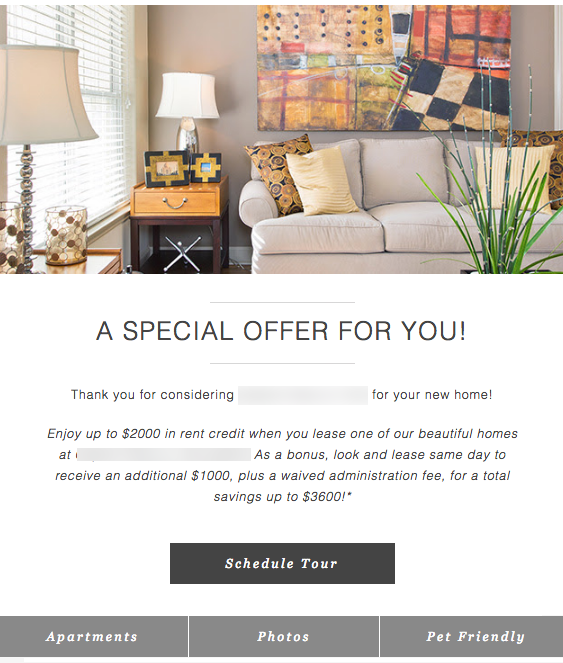 Does the property send quality emails to nurture the prospect? Does the property have a self-service option to schedule a tour? Does the property remind the prospect of their tour? Does the property follow up once the prospect missed their tour? We sent one of our employees undercover to investigate 56 aggressively marketed properties from 28 different property management companies. Additionally, we considered properties owned and managed by the same company and listed in the NMHC’s 2017 “Top 50 Owners” list as Owner/Operators and identified properties managed by a company different from the company that owns it as 3rd Party Managers. We go into more detail about our methodology at the end of this post. But let’s go ahead and dig into the results, now! Like what you’re learning so far? Get more illustrated technology explainers for MFEs by signing up for Multifamily Minute! Metric #1: Was the Property Responsive? A responsive property responded within 48 hours of a contact form submission. The contact could have been an email or a phone call, but not an auto-responder. This first comparison clearly showed which properties were more responsive. 97.5% of the Owner/Operator properties responded within the first 48 hours, while only 54.2% of 3rd Party managers responded. Let’s look at this statistic another way. A whopping 45.8% of 3rd Party managers were non-responsive to the contact form submission. Nearly half of their leads were ignored. Now compare that number to the Owner Operator. Only 2.8% of the Owner Operator leads were not contacted. The difference is shocking. Especially when you consider that all of the surveyed properties were aggressively marketed. Why would a property throw away good marketing money with poor operational follow-up? Owner Operators have set up automated processes and systems to respond consistently to prospects. A large block of 3rd Party Managers have not set up automated systems to respond consistently to prospects. The Owner Operators were clearly more successful in responding to their leads. Will the 3rd Party Managers do better when it comes to the other metrics? Read on to find out! How Long Did it Take for a Property to Follow-up? Metric #2. How Many Properties Follow Up with an Email in an Hour? For this metric, we measured how many properties sent an email within an hour. We did not count non-personalized confirmation emails. Once again, the Owner Operators out-performed 3rd Party Managers. But, not by much. We found that 34.4% of the Owner/Operator properties sent an email within an hour. On the other hand, only 16.7% of the 3rd Party Manager properties did the same. The above numbers change significantly in favor of Owner/Operators if we consider any email sent any time. Specifically, 96.9% of the Owner/Operators responded with an email. On the other hand, only 25.0% of the 3rd Party Managers did the same. Metric #3. How Many Properties Follow Up with a Phone Call in an Hour? For this metric, we measured how many properties called within an hour. The conventional wisdom is that properties should call a lead within an hour of a contact form submission. Surprisingly, there is not a significant difference between the Owner/Operators and the 3rd Party Managers phone call follow-ups. That is, 18.8% of Owner Operators called within an hour. A very similar 16.7% of the 3rd Party Managers did the same. Are Phone Calls Dying in Multifamily? Owner/Operators performed much better than 3rd Party Managers in almost every metric on this survey. So, why did the call rate of the top Owner/Operators match the 3rd Party Managers? Top Owner/Operators are downgrading phone calls in their drive for automation. …they have neglected phone calls. Here is why. We know from our personal conversations that top Owner Operators are aggressively automating. A phone call gets in the way of automating the lead-to-lease process. Phone calls are disruptive. Most millennials would prefer to let an unknown caller go to voicemail. Digital channels are taking over. Millennials prefer email, text or the web over a phone call. To be clear, we are not suggesting multifamily should stop calling. There is nothing in these numbers to suggest that. But phone calls may be dying as a first response channel. Owner Operators are aggressively automating their lead-to-lease process. 3rd Party Managers who are not are being left behind. But, that’s not the only casualty. As automation picks up steam, phone calls may also be dying as a first follow-up channel. The evidence is in the neglect of Owner Operators use of phone calls as a first follow up. So, how are these two different types of organizations doing when it comes to nurturing leads…? We cover that next. Metric #4: Do the Properties Nurture their Prospects? The prospect received nurturing emails. These emails informed, educated or excited the prospect. Or, an agent sent a highly personalized email to the prospect. The prospect did not receive nurturing emails. They received transaction confirmation emails or sales-focused “lease-now” emails. These emails did not seem to be personalized and felt very generic. Let’s get to the results first before we give examples of the above emails. Like the previous metrics, the results show the Owner/Operators were more effective than the 3rd Party Managers by a large margin. 90.6% of the Owner Operator properties surveyed sent nurturing emails. Only 12.5% of the 3rd Party Managers sent the same. Clearly, Owner Operators understand the value of nurturing emails. And, they have built the systems and processes to nurture their prospects well. Not only do Owner Operators understand nurturing, they know that email quality matters. Here’s the distribution of follow-up quality between the two groups. As proof, check out the distribution of email quality between the two groups. The contrast is obvious. Only 3.1% of the Owner Operator properties did not follow up by email. But, as many as 58.3% of the 3rd Party Managed properties had zero email follow-up. At the next level, 6.3% of Owner Operators had some follow-ups but it was of low quality. Comparatively, 29.2% of 3rd Party Managed properties had low quality follow-ups. Nurturing emails inform, educate or excite the prospect about the property. They could include information about the neighborhood, amenities, features, etc. The group of Nurturing emails also included highly personalized emails sent from an agent to a prospect. While these emails may be simple textual emails, their level of personalization makes them high quality. Non nurturing emails scream ‘Buy Now’. There is value to these emails, so we do not discourage their presence. However, if a property sends nothing but non nurturing emails, we regard that communication as a Low Quality “Non nurturing” Follow-up. Here is an example of a non-nurturing email. Clearly, Owner Operators understand the value of nurturing their leads. 90.6% of Owner Operators sent nurturing emails. In contrast, only 12.5% of 3rd Party Managers sent nurturing emails. Additionally, 87.2% of the 3rd Party Managers sent a low-quality follow-up or did not follow-up at all. The comparable number was 9.4% for Owner Operators. That’s three metrics in a row for the Owner/Operators have outperformed the 3rd Party Managers. Will the 3rd Party Managers do better in the next metrics? Keep reading! Could Leads Self-Serve Using an Automated Tour Scheduler? Metric #5: Did the Property Have a Tour Self-Scheduler? This next metric covers how many properties are using tour self-schedulers on their website. Properties that simply had fields in their contact forms that allowed prospects to request tours were not counted as having self-schedulers. A true tour self-scheduler allows users to pick a date and time for a tour, and then have it instantly pushed into the internal systems of the property. Like the first metric, it is obvious which type of organization is on top of the tour self-scheduler trend. An impressive 100% of the surveyed properties managed by owner/operators had tour self-schedulers. In contrast, only a dismal 20.8% of third-party managed properties had self-schedulers. There is no reason why tour scheduling should require manual effort from an agent. These results show that all Owner/Operators understand this. They have transformed tour scheduling to be an automated, fast, and simple self-service. If you are a 3rd party manager without an automated tour scheduler, you lag behind the top Owner/Operators. An automated tour scheduler will get you up to par with the top Owner/Operators. In addition, it will allow you to be in the top 20.8% of your bracket. Up next: we will compare the effectiveness of tour scheduling in more detail. Will the Owner Operators match the 3rd Party Managers like they did for phone calls? Or, will they be far ahead? Were Leads Sent a Night-Before Tour Reminder and Missed Tour Follow-up? Metric #6: Does the Property Send Tour Reminders? All the surveyed Owner Operator properties had an automated self-scheduler. 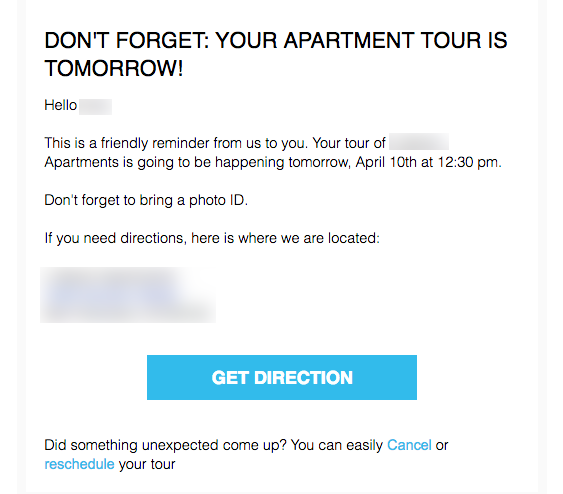 While they can be proud of their automated tour scheduler, they have less to celebrate when it comes to sending tour reminders. Only 18.8% of the Owner Operator properties sent reminders to prospects before a tour. This is surprising. If you have an automated tour-scheduler, it is easy to set up an automated tour reminders. So, why not just do it? Only 12.5% of the 3rd Party Managed properties sent tour reminders. This is not surprising. Only 20.8% of these properties have automated their tour scheduling process. So, they do not have the automation maturity to send tour reminders. Metric #7: Does the Property Follow Up on a Missed Tour? If a prospect schedules a tour, they have strongly signaled their intent to lease. But, they could miss their tour for many possible reasons. A property should not presume the prospect has lost interest. At the very least, a property can request the prospect to reschedule. Owner/Operator properties understand the above much better than the 3rd Party Managers. As many as 40.6% of Owner Operator properties followed up on a missed tour, while only 8.3% of the 3rd Party Managers followed up. Having said that, even the Owner Operators could have done much better. There is little reason to avoid a follow up for every 3 out of 5 missed tours. If a prospect has scheduled a tour, they are a high value lead. Properties should go the extra mile to make sure they show up. At the very least, they should send the prospect a reminder of the tour. And, if the prospect missed the tour, send them a request to reschedule their tour. Both the Owner/Operators and the 3rd Party Managers could do a lot better in this area. Prospects have other choices. If you let them go, they will be gone forever. We started this survey wanting to understand how properties were nurturing leads to visit their property. We focused on how effectively two classes of property management companies use marketing automation technology, as well as the quality of their follow-up for leads. Many of the Big REITs (Owner/Operators) largely appear to have embraced the idea of automation when it comes to responding to prospects, drawing them to their properties and nurturing those leads throughout the lifecycle to the lease stage. While some 3rd Party Managers are on the right track with automation, based on our survey results below, we can see that their rate of implementation is much further behind the Big REITs. Metric 1: Was the property responsive? Result: While 97.5% of the Owner/Operator properties responded within the first 48 hours, only 54.2% of 3rd Party managers responded. Take away: Automation is gaining strength. A huge majority of Big REITs are focusing on implementing automated processes and systems to respond to prospects. While 3rd party managers are somewhat responsive they have yet to fully embrace the concept of automation. Metric 2: How long did it take the property to follow-up via email? Result: We found that 34.4% of the Owner/Operator properties sent an email within an hour. On the other hand, only 16.7% of the 3rd Party Manager properties did the same. Take away: Email response time matters. The Big REITs have a much better grasp of the need for timely email responses and have automated systems in place to help produce them. 3rd Party Managers are not only behind in the timeliness of their responses, but would appear to have dropped the ball when it comes to responding via email, in general. Metric 3: How long did it take the property to follow-up via phone? Result: 18.8% of Owner/Operators called within an hour. A very similar 16.7% of the 3rd Party Managers did the same. Take away: Phone calls are dying in the multifamily industry. While the Big REITs have done much better in almost every measure of automation, their attention to phone calls is almost as bad as 3rd party managers. We believe that phone calls are getting in the way of automation. And, they are simply not a priority anymore. Metric 4: Did the property send quality emails to nurture the prospect? Result: 90.6% of the Owner/Operator properties surveyed sent nurturing emails. Only 12.5% of the 3rd Party Managers sent the same. Take away: Automation means better lead nurturing. Big REITs fully understand the value of nurturing their leads, particularly with follow-up, and have built the systems and processes needed to execute these tactics. 3rd Party Managers need to recognize the need to follow up with leads throughout the entire lifecycle, in order to nurture the prospect into a lease. Metric 5: Did the property have a self-service option to schedule a tour? Result: An impressive 100% of the surveyed properties managed by Owner/Operators had tour self-schedulers. In contrast, only a dismal 20.8% of third-party managed properties had self-schedulers. Take away: Automated tour scheduling boosts lead numbers. The Big REITs understand that tour scheduling should be an automated, fast and simple self-service. 3rd Party Managers would do well to emulate these Owner/Operators and set up automated tour scheduling so they don’t lose potential prospects! Metric 6: Did the property remind the prospect of their tour? Result: Only 18.8% of the Owner/Operator properties sent reminders to prospects before a tour, and only 12.5% of the 3rd Party Managed properties sent tour reminders. Take away: Tour reminders improve touring rates. Both the Big REITs and 3rd Party Managers have yet to realize the importance of reminding a lead about their upcoming tour, which can serve both as a touch of personalization and result in a decreased amount of missed tours. Metric 7: Did the property follow-up if the prospect missed their tour? Result: As many as 40.6% of Owner/Operator properties followed up on a missed tour, while only 8.3% of the 3rd Party Managers followed up. Take away: Missed tour follow-up reminders prevent leads from going cold. The Big REITs seem to understand the value of following up on a missed tour (better than 3rd Party Managers), therefore they are not missing out on as many high value leads. Again, it is by having the right technology in place that they are able to do this. In general, it would appear that the Big REITs are leading the way when it comes to recognizing the value of automation as a key component to their lead nurturing strategy! You can learn more about the methodology behind this survey, below. We wanted to see what the state of automation in multifamily was so we conducted a survey in March and April of 2018. We focused on how effectively two classes of property management companies use marketing automation technology, as well as the quality of their follow-up for leads. The two classes were divided into “Owner/Operators” (O/O), and “Third-Party Managers” (3PM). Four Owner/Operators were chosen for the first survey, with eight properties from each company surveyed, for a total of 32 properties. The second survey involved 24 companies, with one property from each company being surveyed. The properties surveyed were from all over the country in major metro areas. The survey totaled 56 properties from 28 companies. The survey lasted for 14 days. We had a member of the Hy.ly team pose as a prospect for the surveys. He used a pseudonym, submitted contact forms for each of the properties surveyed on their website, and recorded all correspondence. Once the contact forms were submitted, the clock started, and we began recording events. Our prospect did not reply to any emails or phone calls during the surveys. The only time he reached out to properties was in order to schedule a tour if no online tour scheduler was available. 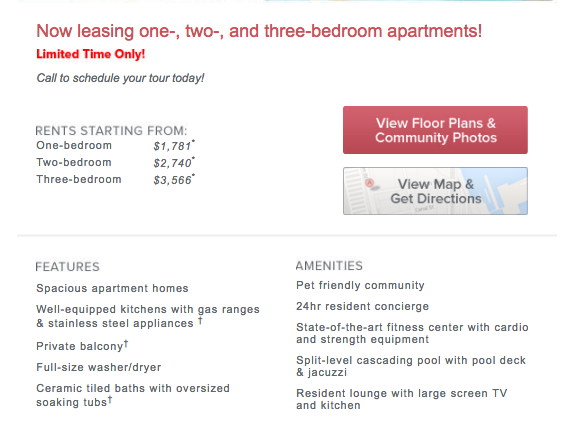 If the property had a tour self-scheduler on their website, it was used to schedule a tour and the time was marked. If the property did not have a self-scheduler, our prospect called the properties the day after the contact forms were submitted and scheduled a tour that took place the next day. Every tour scheduled was going to be missed and measuring how a property interacts with a prospect before and after the tour was crucial to see if there’s effective usage of email automation. Whether the property reciprocated contact with either an email (not an auto-responder) or phone call within 48 hours of the contact form’s submission or not. A tour self-scheduler was only counted as such if it asked the prospect to choose a date and time on a calendar for their appointment. “Non-Nurturing Emails” (Mediocre) – “Non-nurturing emails,” were emails that included special offers or other promotional content. “No Email Follow-Up” (Poor) – Properties that didn’t send any emails were put in this class. The time properties took to follow-up after our contact form submission via email. Ideally, properties should email within an hour of a contact form being submitted. If properties sent an email before the tour reminding the prospect of their appointment. If properties followed up by email or phone after a tour was missed.